'A Global Bathtub': Rethinking The U.S. Oil Export Ban Amid rising production, U.S. oil companies say Congress should end a 1970s-era ban on oil exports. Some energy analysts agree, saying the way we visualize the global marketplace as a sort of chess game is holding us back. They say it's time for a new image: a bathtub. A pipeline carries oil at the federal Strategic Petroleum Reserve facility near Beaumont, Texas. U.S. oil companies are urging an end to a 1970s-era ban on oil exports. When oil supplies ran short and gasoline prices spiked four decades ago, angry drivers demanded relief. 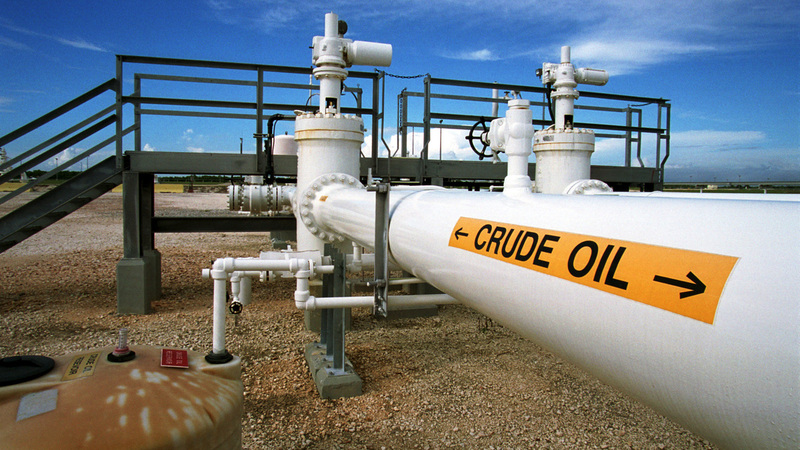 Congress responded in 1975 by banning most exports of U.S. crude oil. Today, domestic oil production is booming, prompting U.S. energy companies to call for a resumption of exporting. Many economists agree. But would that bring back the bad old days of shortages? Would you end up paying more at the pump? Supporters of exports say Americans should not allow 40-year-old images of an energy crisis to distort how we see the world today. They argue that in the 1970s, a particular vision of oil markets got embedded into our national psyche, and now it's time to update our worldview to more clearly see what's happening. War is raging in the Middle East. Saudi Arabia and other members of the Organization of the Petroleum Exporting Countries, or OPEC, are looking for ways to hit back at supporters of Israel. They launch an embargo that blocks oil deliveries to the United States. News reports label the embargo a "political weapon," intended to push America into an energy crisis. Soon, oil prices are quadrupling and lines of cars are snaking around gas stations with empty pumps. Energy independence becomes a national obsession. President Richard Nixon addresses the nation, promising that by the end of the decade, "Americans will not have to rely on any source of energy beyond our own." To that end, Congress blocks companies from sending U.S. oil to other countries. And all of that tells you something about how Americans were visualizing the problem. "People saw it basically in terms of physical barrels of crude oil," said Paul Stevens, an energy expert at Britain's Royal Institute of International Affairs. Stevens says political leaders tended to imagine those barrels functioned as pieces on a chess board. A strategic game was playing out across a map of the world, and the goal was to control as many barrels as possible to achieve energy security. "It was felt that if you're obsessed by having physical security of crude oil, well, you don't want your crude oil going out to all these nasty foreigners," Stevens said. "You want to hang on to it yourself." However, over time the predominant metaphor for picturing the world oil market shifted from those little barrels of crude to what Yale energy economist Bill Nordhaus calls the "Global Bathtub of Oil." "The idea is you have this big, huge pool of oil," Nordhaus says. "And you have these spigots going into it that are from different places," such as oil-rich Saudi Arabia, Russia and Nigeria. Those spigots turn on and fill the global bathtub, while big oil-consuming countries such as the United States act like drains taking out the oil. "And the thing about the oil bathtub is that it doesn't really matter who the spigots and who the drains are," Nordhaus says. "It's really the total amount coming in and the amount coming out that determines world oil prices." Nordhaus tracked world oil prices over two decades, and found the global price for a barrel of crude tends to be the same whether the oil is from Saudi Arabia or Scotland. "The extent to which these prices move together is really phenomenal," he says. According to bathtub theory, no one supplier can completely disrupt the oil market, and the more oil that goes in bathtub, the better energy security is for everyone — including Americans. With the boom in shale oil as a result of hydraulic fracturing, American oil production is forecast to approach levels not seen since the early 1970s. Nordhaus says since U.S. refineries are now struggling to process all of that crude, Washington should lift the export ban and add American oil to the global bathtub. "You have a really valuable resource sitting there, whether it's in Texas or North Dakota or wherever," he says. "It's something that people will pay a lot of money for, but there's no way to get it out" and into the global marketplace. But opponents say the old idea of keeping U.S. oil for Americans is simple common sense. They say lifting the export ban could raise gas prices for consumers. The Center for American Progress, a left-leaning research group, issued a report this past week saying that the surge in oil production finally has started to turn the 1970s-era goal of energy independence into a reality. "The oil industry would squander this new-found price stabilization and energy security by lifting the ban on crude oil exports," the report said. "Doing so would enrich oil companies by enabling them to sell their oil at the higher world price, but it could increase domestic gasoline prices and reduce our energy security."